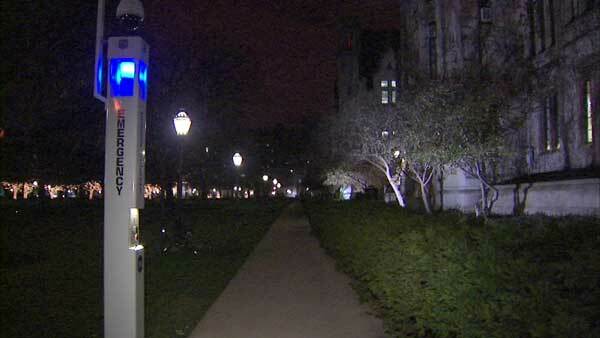 CHICAGO -- A suspect was arrested Monday in connection with an online threat of gun violence at the University of Chicago that prompted the school to cancel all classes and activities. Joseph Fitzpatrick, a spokesman for the U.S. attorney's office in Chicago, confirmed the arrest but offered no details, saying only that charges are pending. The University of Illinois at Chicago said that one of its students who lives off-campus was the person arrested, but did not provide details. The university, one of the leading teaching and research institutions in the nation and where President Barack Obama taught law, said in a statement Sunday night that an online threat from an unknown person mentioned the quad, a popular gathering place, and 10 a.m. Monday. "It was pretty specific in terms of time and place," university spokesman Jeremy Manier said. It wasn't immediately clear if the arrest would immediately change the status of classes and other activities for Monday. The University of Chicago statement urged faculty, students and non-essential staff to stay away from the Hyde Park campus on Chicago's South Side through midnight Monday and told students in college housing to stay indoors. The normally bustling campus was largely quiet Monday morning with few students walking in the surrounding neighborhoods. Chicago Police Department squad cars and a wagon patrolled streets, along with campus security cars. Security staff in yellow jackets stood on campus walkways, including the quad that was mentioned in the threat. The time mentioned in the threat came and went without incident. Rafael Munez headed to work at a student dining hall, where he's been employed for three years. He said he was a little nervous walking onto campus on Monday, particularly thinking about recent campus shootings. "My wife didn't want me to come to work," he said. "It's scary ... It puts you on your toes." The announcement, which he said was the first time he's heard of the school closing for any reason besides inclement weather, also was a reminder of what residents in neighborhoods near campus, which is on the South Side of Chicago, live with every day. "A lot of people on the South Side live in constant fear of gun violence and, in a sense, we are a bit sheltered from that," he said. Junchen Feng, who is pursuing a doctorate, said the threat raised his awareness about gun violence in Chicago and beyond. "For the first time I was thinking about people who live in Syria, Afghanistan, Pakistan ... where they live under constant threats of death and violence," said the student from China, who planned to spend the day at home and in a campus building that was a five-minute walk away. "It's a mindset that we just don't we have." Manier said the cancellation of classes and activities would affect more than 30,000 people, including undergraduate and graduate students, faculty and staff. The University of Chicago Medical Center was open to patients and had added security, the university said. The Medical Center has nearly 7,500 staff.